Ascending Butterfly: Real Steal Movie Review! 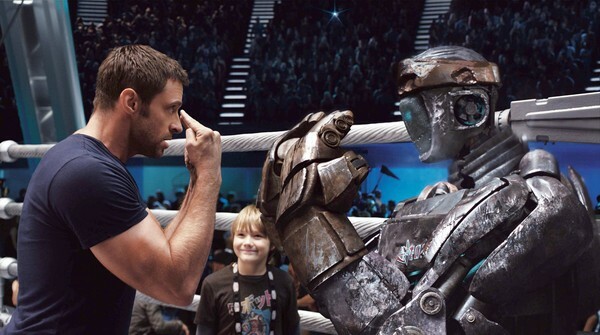 Real Steel is out in theaters, and if you can, catch it in Imax so you can really enjoy the fight scenes. The movie is set in the near future and the sport of boxing has gone hi-tech. Robot Boxers in underground matches have replaced human boxers (apparently HBO disappears in the very near future, and we must resort to watching Robot Boxing in underground matches in questionable 'arenas'). 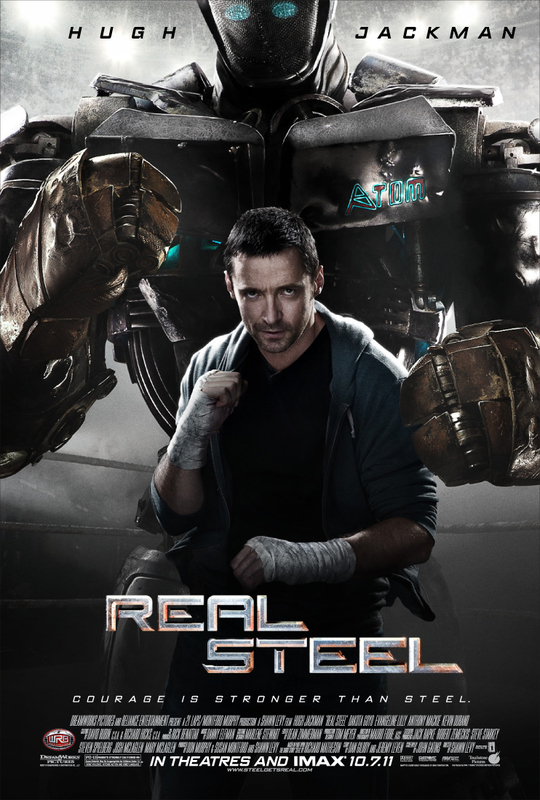 It's sort of where 'Rock Em Sock Em Robots' and 'Rocky Balboa' meet with a touch of 'Transformers' for good measure. While this is PG-13 rated, I warn you Hugh Jackman's character, Charlie Kenton, is not quite 'likable', there is some strong language, and an opening scene with a bull that I could have lived without. Other than the opening scene, it moves along relatively predictably, the fight scenes are enjoyable (yes folks, this butterfly has always been a bit of a tomboy and studied martial arts instead of ballet), and the humanizing of the 'good guy' robot 'Atom', and his relationship with Charles Kenton's son, Max Kenton (Played by Dakota Goyo who you may remember played Young Thor in the Thor Movie) gave the movie a little more depth. Evangeline Lilly as Charles Kenton's ever faithful love interest Bailey was OK, but she's no Talia Shire. (OK, I promise no more Rocky references). I can't wait to try out the Video Game (although I probably won't get the chance, as it's not available for Wii, it's being released for the Xbox 360 (on October 12) as well as Playstation Network (October 18). So if any of you try it out, please come back here and let me know all about it! It has the feel good ending audiences can get behind, and enough hi-tech cool factor to keep everyone involved! Visit the Real Steel website to make a cool paper robot and catch up with all things social for Reel Steal on Facebook and Twitter too! FTC Info: This is a NON-compensated Post. I attended a Press Screening of Reel Steal. All opinions are my own. I saw a trailer and also so Jackman on the tonite show recently. I think I will pass on it even though it has a feel good ending. Seems like it is more suited for adolescent boys!